Cover for Volume 21, Issue 21. 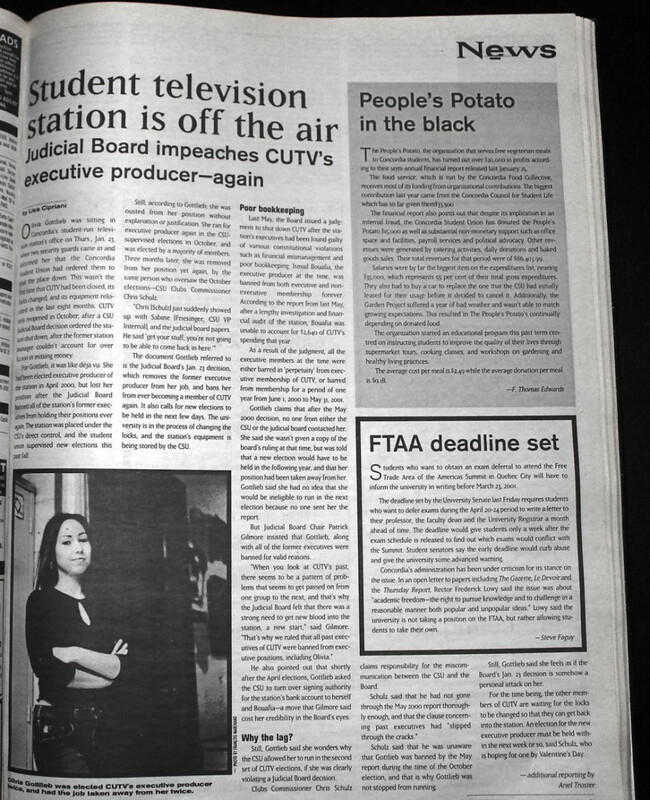 Click through the following photos to learn about past troubles CUTV has faced. 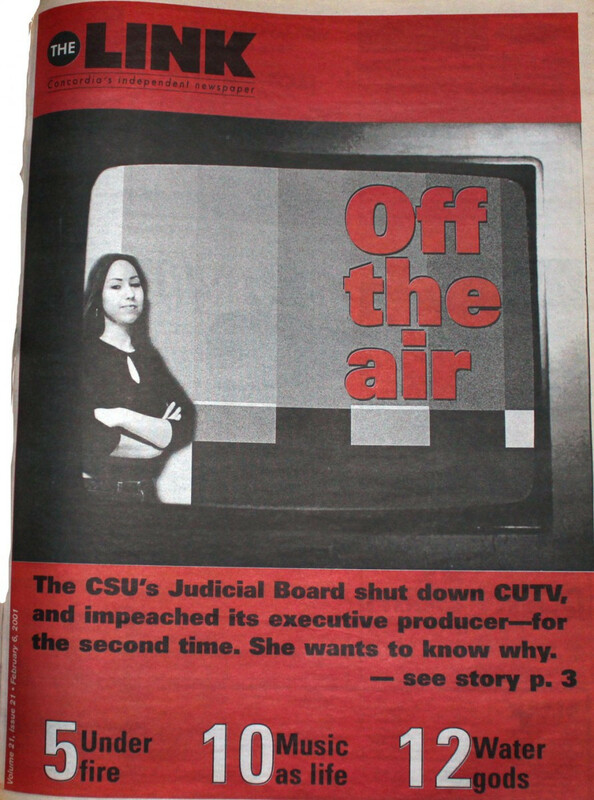 2001 the CSU takes control of CUTV after approximately $2,000 went missing. 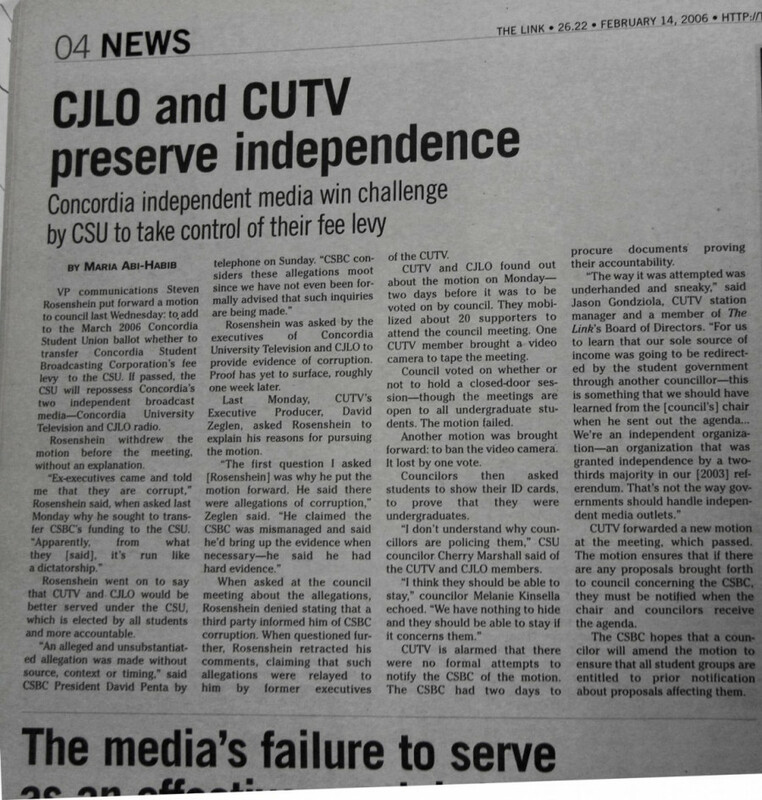 2006 The CSU tries to take control of CUTV, arguing it is “run like a dictatorship.” The motion is withdrawn before any vote could take place. 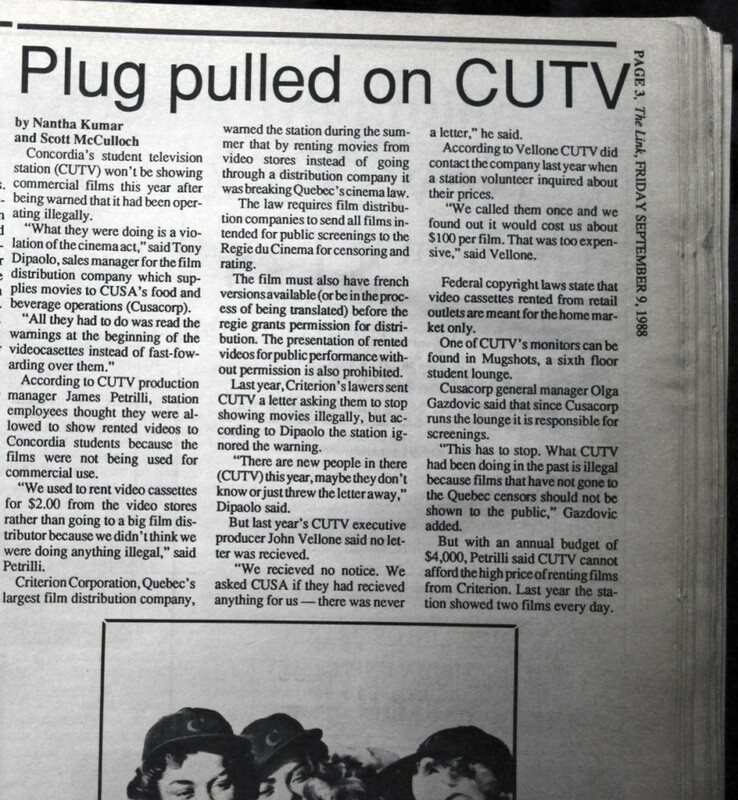 It’s not the first time that CUTV, the oldest student-run TV station in Canada, has found itself in trouble. After a string of resignations, the station is now left with only one person sitting on the provisional Board of Directors instead of the three required under Quebec law. Click through the above photos to learn about past management issues the campus and community TV station has gone through. 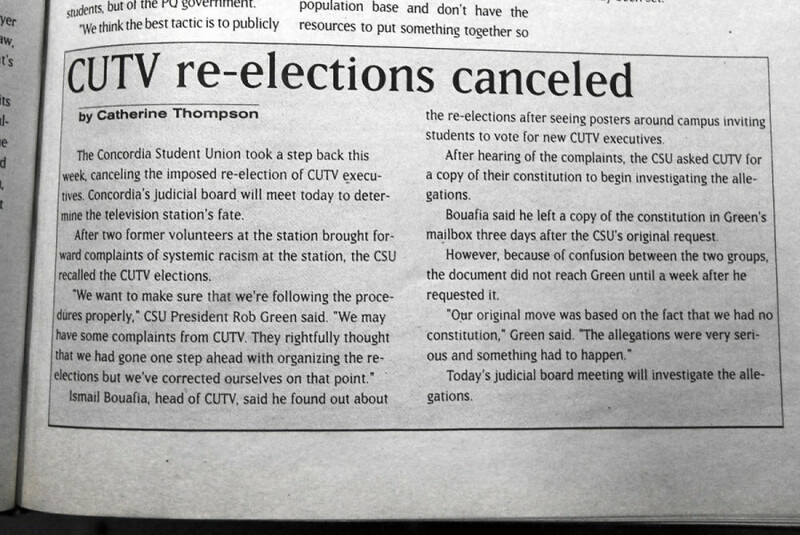 In 2001, the Concordia Student Union took control of CUTV after approximately $2,000 went missing. “Chris [Schulz] just suddenly showed up with Sabine [Friesinger, at the time CSU VP Internal], and the judicial board papers. 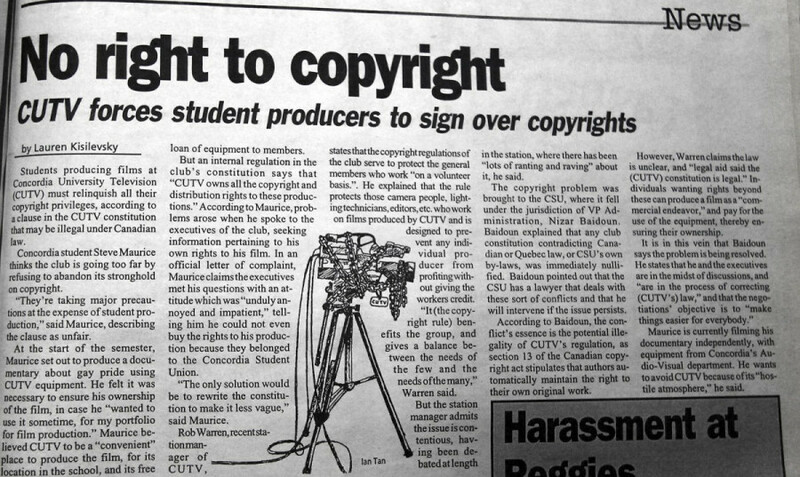 He said ‘get your stuff, you’re not going to be able to come back in here,’” said Olivia Gottlieb, the CUTV executive producer in 2001. But fast-forward 11 years and the tables have turned—Friesinger is currently the only CUTV board member left. “When you look at CUTV’s past, there seems to be a pattern of problems that seems to get passed on from group to the next,” then Judicial Board Chair Patrick Gilmore told The Link in 2001.